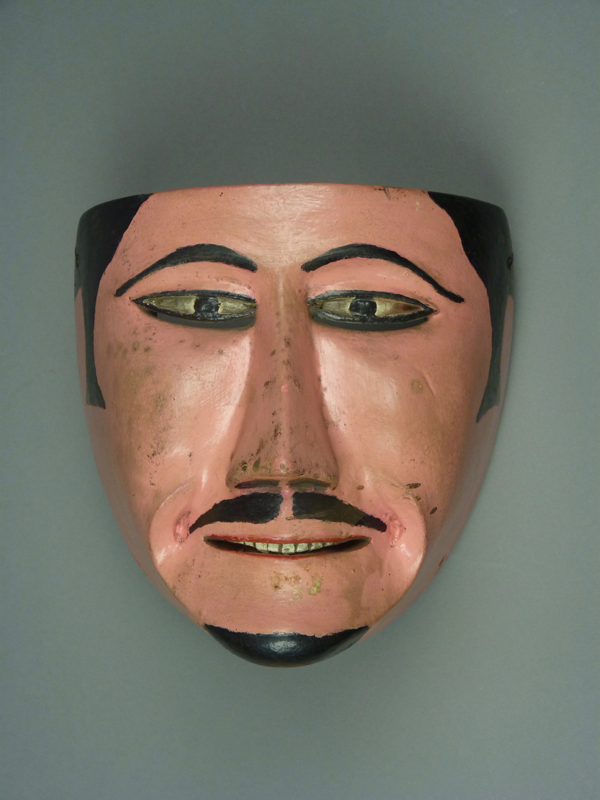 There is a style of Mexican mask that collectors are prone to call Moros. Indeed this name tends to be a generic label for masks from various dances, particularly in Northern Veracruz, but also in other states. My goal is to underscore some design elements that are so typical for this area that, when you see them, you realize that you are looking at a carving from the Huayacocotla/ Carpinteros area. I would certainly begin with an actual Moor, but ironically, of the five masks that encouraged me to write about this subject, none are actually Moors or Christians. However, all five represent Spaniards, four Soldiers and one Cowboy. I will start with an Español (Spaniard) that was used in Carnaval. 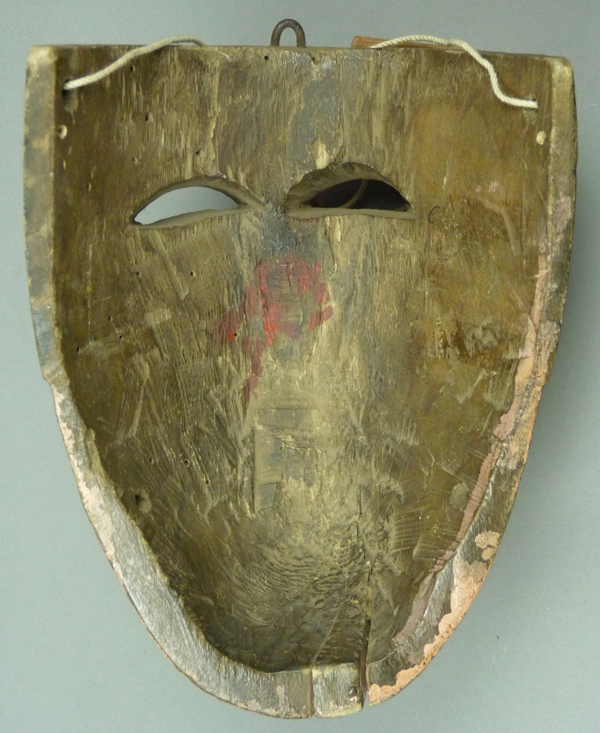 I obtained this mask from the Indigo Gallery, in Philadelphia, in 1996. It had been originally collected in the field by Jaled Muyaes and Estela Ogazon in about 1990, in Cruz de Ataque, a place near Huayacocotla. It was viewed as being much older, perhaps as old as the 1920s. Note the blue color around the eyes, meant to indicate that this mask depicts a Caucasian or a Christian. The patina is impressive. The iron staple in the forehead is a typical marker from this area. 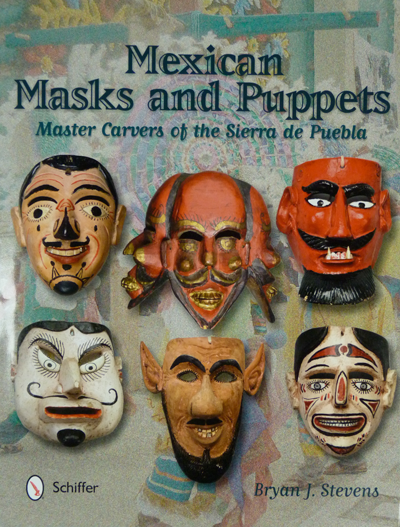 We saw this feature on the Mojica masks, for example. The red spots on the cheeks confirm the identity of this dancer as a Spaniard. Because of his light skin he has sunburn. 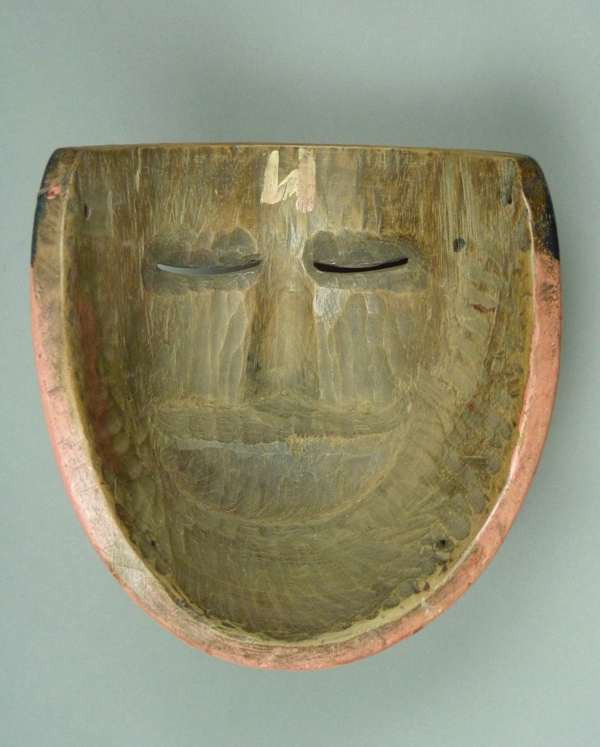 The relief carved hairline is a really typical feature for the masks of this area. 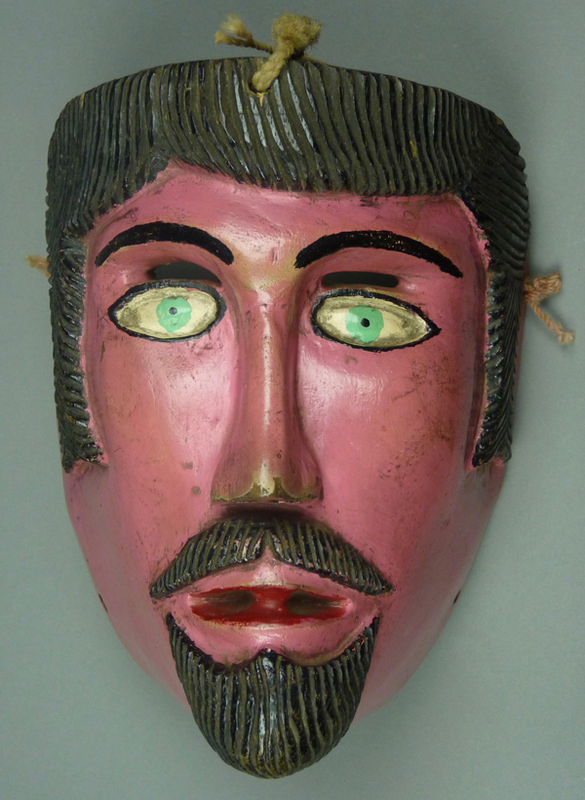 This mask is 8 inches tall, 6 inches wide, and 4¼ inches deep. The back is old and worn. Here is a dance video from Cruz de Ataque during Carnaval The present fashion there is for the use of Azteca masks. The next three masks represent Spaniards from the Conquista, the Conquest dance. This one, which I purchased from Rene Bustamante in 1995, was found in Tolima, Veracruz. Rene thought that it dated to the 1940s. Again we see the blue eyes, code for Christian. The relief carved hairline, with matching mustache and beard, is quite carefully carved. 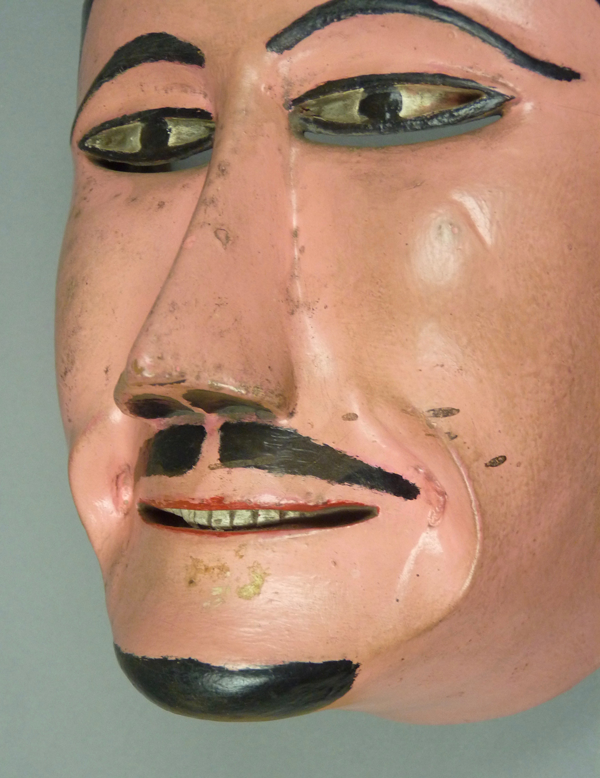 My favorite feature of this mask, which is not typical of the region but reflects the genius of an unidentified master carver, is the way that the tip of the tongue is depicted within the mouth, as if to express the emotion of dread. The sideburns are wonderful too. This mask is 8 inches tall, 6 inches wide, and 4 inches deep. The patina on the back of this mask is extreme. 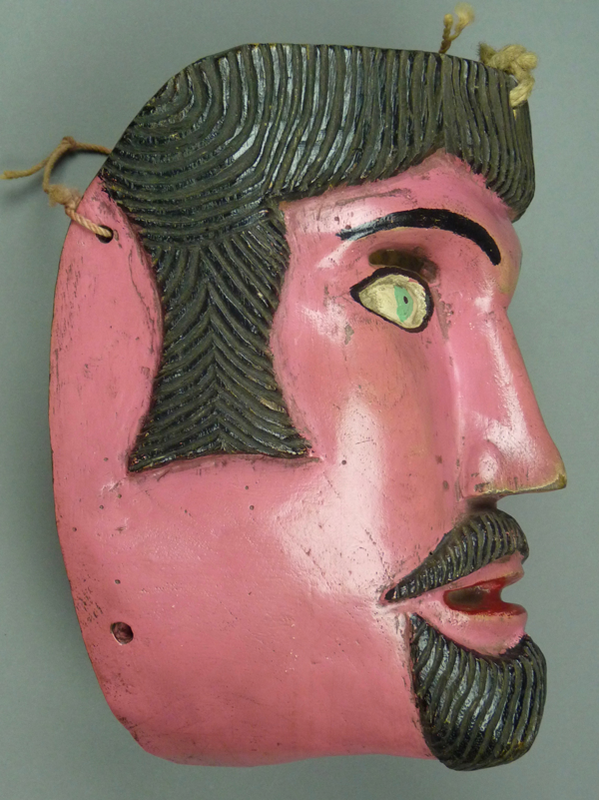 This third mask, another Spaniard from the Conquista, was purchased from Rene Bustamante in 1996. It was said to be from Pajaritos, Veracruz. Note the eyes which resemble those on the first mask. 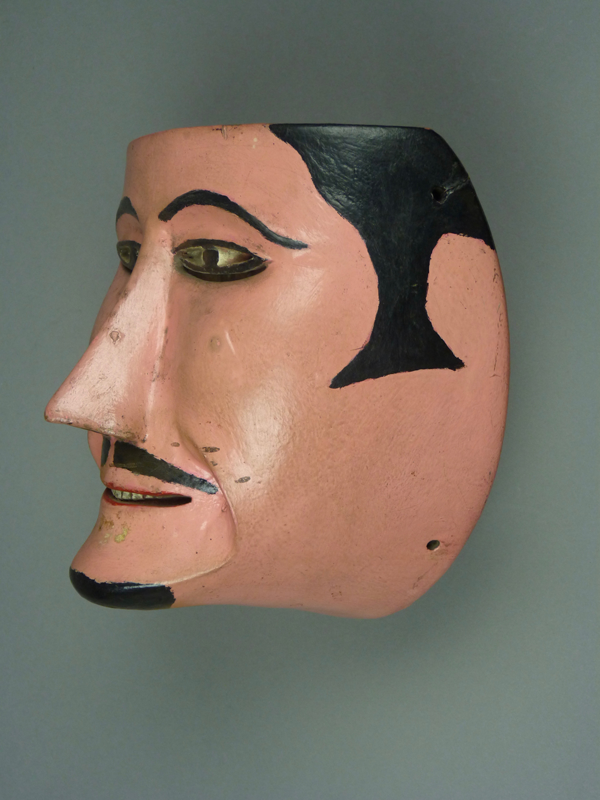 This mask is unusual for the region because it lacks a relief carved hairline, although the shape of the painted sideburns is similar to those on the one we just examined. 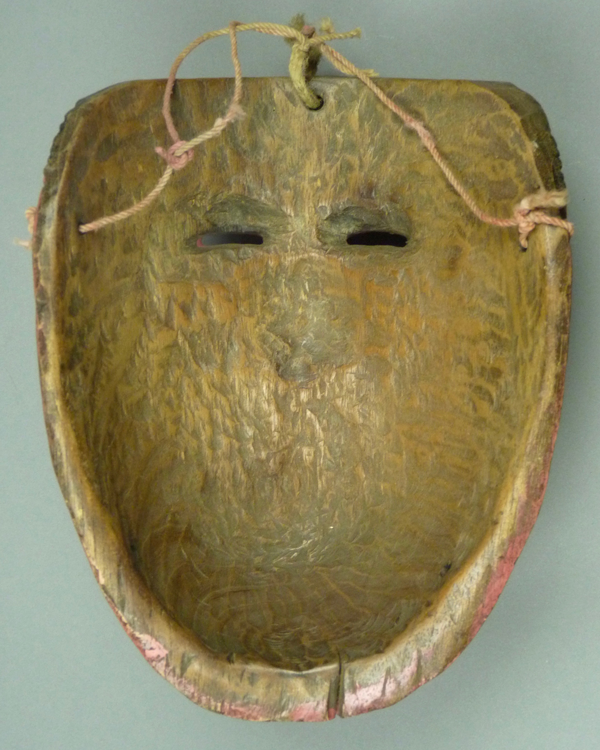 On the other hand, this mask is remarkable for the extreme hollowing and dimples around the mouth, definitely similar to what one sees on the Mojica masks. The side view reinforces our recognition of the sculptural shaping of this face. 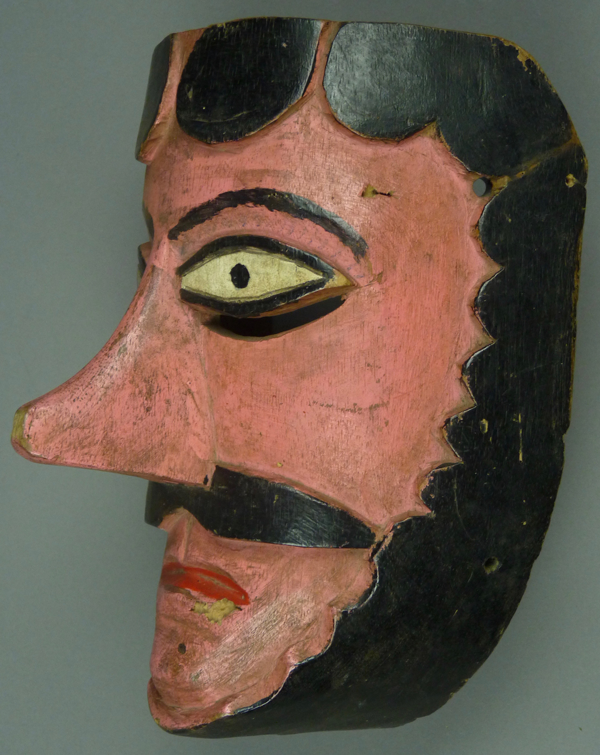 This mask is 7 inches tall, 7 inches wide, and 4½ inches deep. 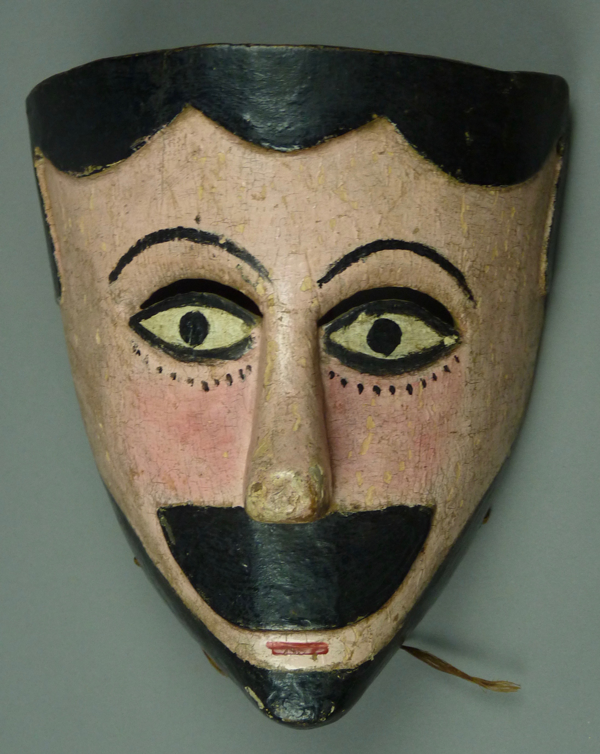 Rene thought this mask might date to the 1930s, although this seems an exaggeration to me. The back does demonstrate marked darkening from use. 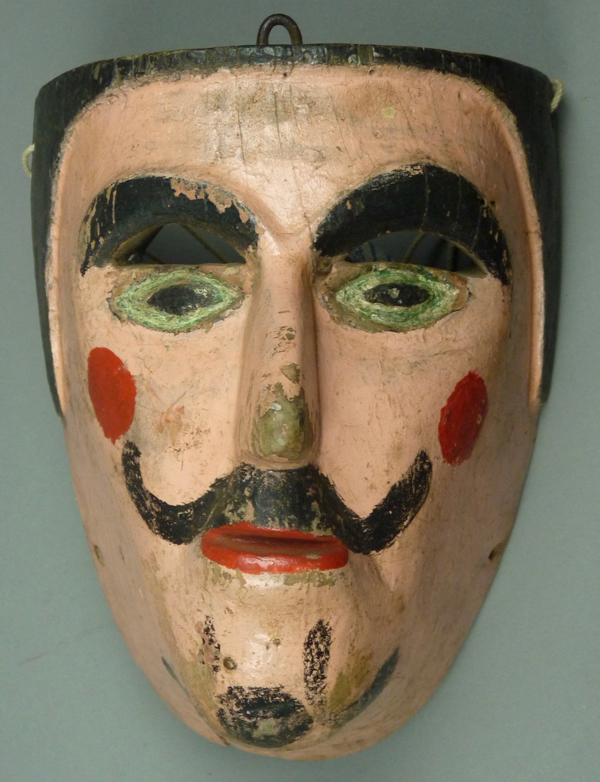 The fourth mask, yet another Spaniard from the Conquest dance, was purchased from Robin and Barbara Cleaver in 1994. They had obtained it from Jaled Muyaes and Estela Ogazon. 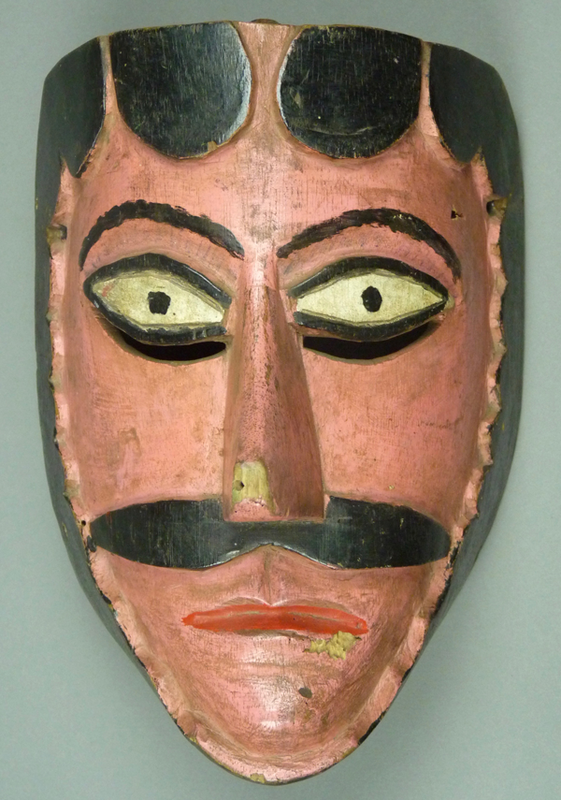 The scalloped relief carved hairline on this mask is very typical for this region, as is the shape of the nose and the mustache. 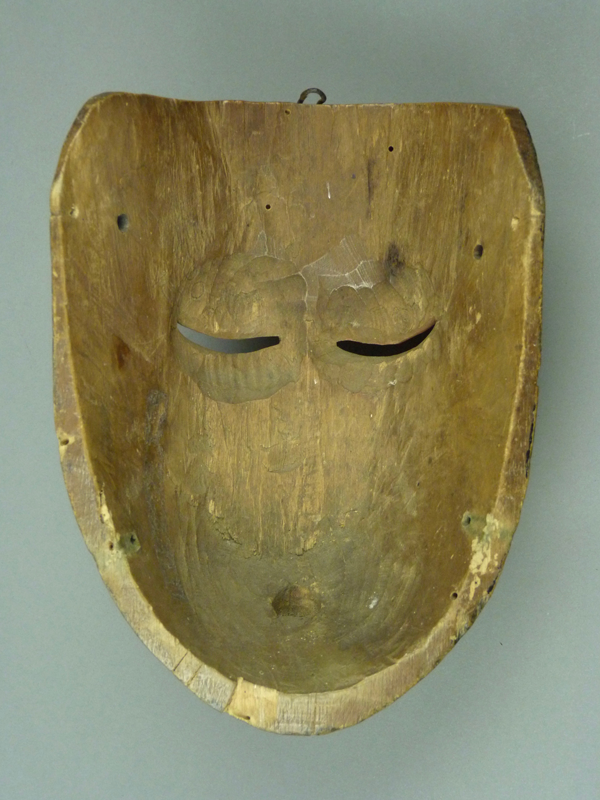 The design of the eyes of this mask also resembles those in the previous masks, although these are not so extremely narrow. 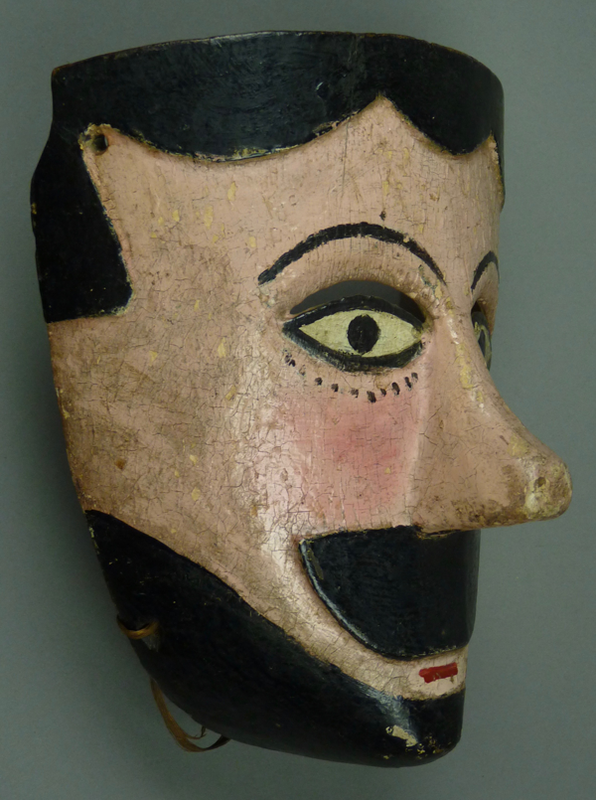 This mask is 7 inches tall, 5¾ inches wide, and 3¼ inches deep. From this angle, I call your attention to the carefully notched corners, which may be a regional marker or the sign of a particular master carver. This is another mask with an excellent pattern of wear. Note again the shaped upper corners. 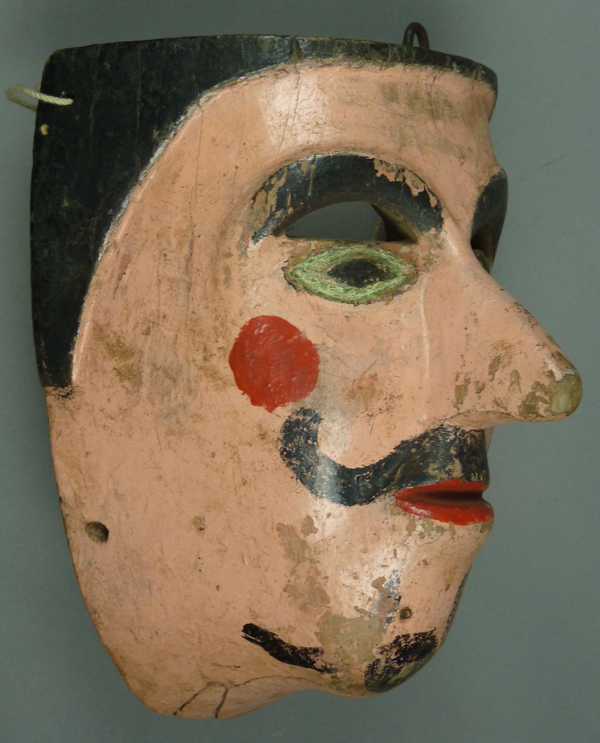 The last of these masks was said to be a Charro cowboy), from El Vado, Veracruz. I bought this mask from Trade, a folk art store in New Orleans that obtained its masks from Jaled Muyaes and Estela Ogazon. After Hurricane Katrina, I worried about the fate of this business and its owner, Kelly Mecheling. If any reader can tell me anything about this, I would appreciate it. A Charro probably dances in a skit about a Torito (a bull). Note the exaggerated scalloped hairline, the typical regional eye design, the relief carved mustache and the very simple mouth. The profile of the nose also conforms to the regional ideal. 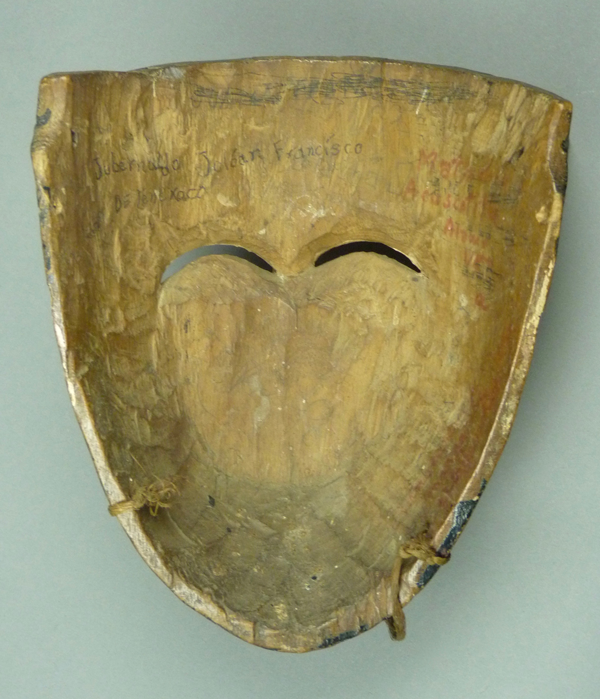 This mask is 8 inches tall, 5¾ inches wide, and 4 inches deep. You may have noticed that all five of these masks are virtually the same size. This is another mask with a staple on top and a dark back. Next week I will turn to Animal masks from this region.